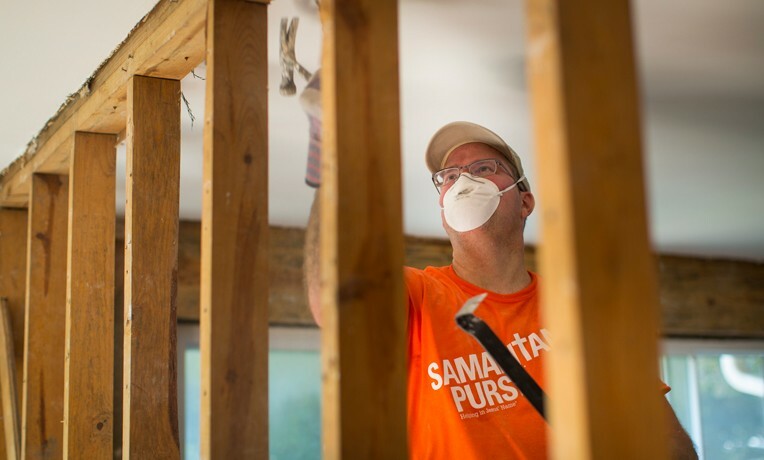 Samaritan’s Purse volunteers are scheduled to serve homeowners until early January in this resort Tennessee city shaken by deadly wildfires. Discouraged, David E. Mitchell plopped down onto the charred remains of what once was a trailer. He had been coming to his burned-out Gatlinburg property for several hours at a time for days, but all he could manage to do was to walk around and stare at the ruins. Tears started flowing. Two weeks before, David, his wife Linda, and their 7-year-old son David Carl narrowly escaped with their lives, barreling down a steep and winding mountain road, racing ahead of flames that raged all around them. Now here he was amid the rubble of his destroyed three-story home. “God, I need help,” the 54-year-old man prayed. The home of David Mitchell was among the hundreds lost in the Gatlinburg fire. Soon after a white Samaritan’s Purse truck pulled up. Two of our volunteers jumped out. They were in the area talking with homeowners, describing the kind of disaster relief work we do after a wildfire, and assessing if we could be of service. They introduced themselves to David and asked if he needed help. “Sure, you bet,” David quickly replied, telling them he was dazed and confused and not knowing what to do. A few days later, a team of Samaritan’s Purse volunteers showed up at David’s home. They delicately and meticulously sifted through the ashes, combing for precious belongings and keepsakes that would mean a lot to his family. David joined in the search. Our team members encouraged David, sharing with him about God’s unfailing love and unchanging grace—and that it was an honor for them to be there for those two days, serving him and his family in Jesus’ Name. Also on hand were Randy Cole and Larry Crawford, crisis-trained Billy Graham Rapid Response Team chaplains, who provided spiritual and emotional care. Among our volunteers were good friends Alison Schick and Janice Gilson. Alison has served on prior Samaritan’s Purse deployments and invited Janice to come with her to Gatlinburg. Janice wasn’t sure she could come because she and her husband, Howard, lost their home in St. Petersburg, Florida, to a fire in May. But God opened the door for Janice to come. The heat from the fire was so intense it melted tires and car parts as families tried to escape. Samaritan’s Purse has been in Gatlinburg for a week, coming alongside distressed homeowners in their time of great need. More than 1,700 structures, including hundreds of homes, were damaged or destroyed by the historic wildfires that engulfed Sevier County in east Tennessee. Our Disaster Relief Unit—a tractor trailer stocked with supplies—is based at the First Baptist Church of Gatlinburg. Our volunteers sifted through the church’s former youth building destroyed by the fire, trying to find ministry memorabilia of its youth minister, Byron Fortner. Homeowner Kyle King, with his wife Doreen and son Mick, prays for Samaritan’s Purse volunteers who worked on their home. We also helped the King family, who live around the bend from David Mitchell. Doreen, her husband Kyle, and their 18-year-old son Mick had been told that they were safe and that the home they were renting would likely go untarnished. But they felt something was amiss, especially as the smoke grew heavier. When they saw on Facebook that the woods along the major artery between Gatlinburg and nearby Pigeon Forge were ablaze, they knew they had to leave immediately. They grabbed their dogs and a few other things—including their Bibles—and departed. Hurricane-force winds soon blew embers up the hill and engulfed their home. “If we had waited 15 minutes more, we wouldn’t have made it,” Kyle said. When the three returned to their property for the first time, they were unsure what they would find. They were amazed that a porcelain praying angel statue, broken off at the waste, was sitting atop a concrete pillar in the middle of the ruins. US Disaster Relief volunteers cleared debris and helped tidy properties destroyed by the fire. Found amid the rubble was the complete set of porcelain birthday dolls that Doreen collected for Emilee since her birth. Mick was especially joyful that we helped him find a pocket watch that his late grandfather had given to him. Retirement for Jerry and Beverly Lovegrove of the Johnson City, Tennessee, area, and Tom and Diane O’Brien of Lake Arrowhead, California, have freed them up to serve as volunteers with Samaritan’s Purse. They served at Doreen and Kyle’s home that day.